Established in 2015, the newly upgraded Doctors Hospital & Medical Center Pathology & Laboratory department fostered a reputation among the area’s private medical practitioners as a provider of prompt, reliable and convenient laboratory testing services. 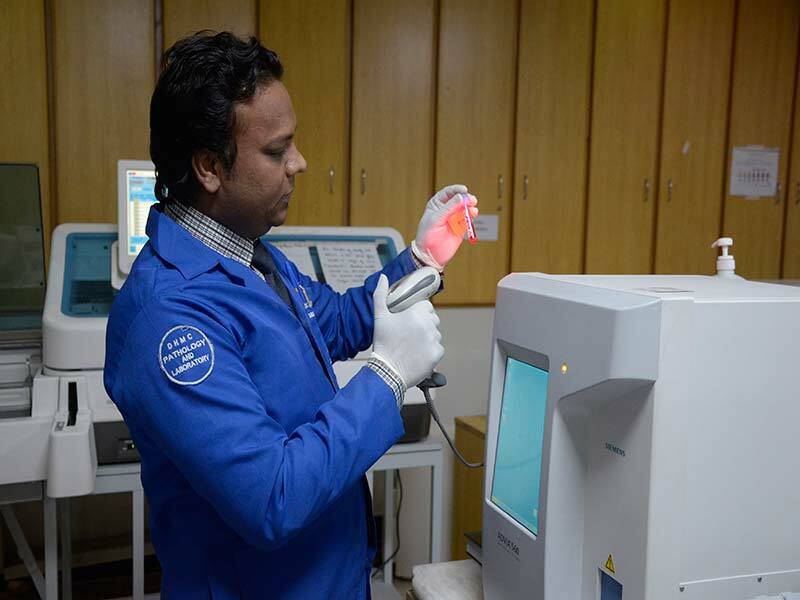 Since its establishment, DHMC Lab is continuing its tradition of uncompromising quality, personal service and overall excellence to become the dominant full-service independent medical laboratory in Lahore. Doctors hospital department of pathology and laboratory is a full service clinical and anatomic pathology laboratory dedicated to provide diagnostic excellence. Our facility utilizes latest state of art instrumentation and medical technology. 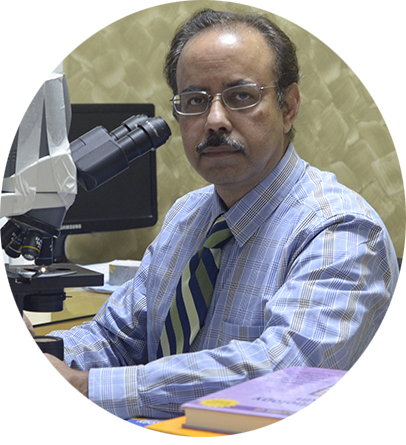 Our staff consists of American Board certified pathologist and professor level pathologists as well as medical technologists striving to meet the highest standard of care that our clinical practices. Our mission is to be the regional leader in the efficient delivery of high-quality, cost-effective medical laboratory services and to continually improve our services to meet our customers' needs, as well as to prosper as a business. Click below to view your lab results online. 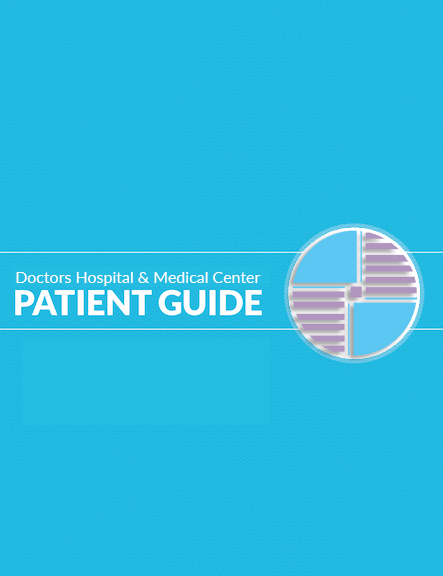 The lab at Doctors Hospital offers tests covering the full spectrum of medical pathology. 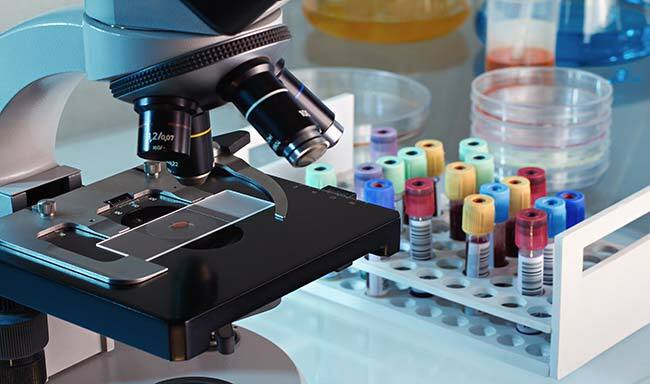 All of our tests are conducted error free by our high trained staff and senior pathologists to ensure the highest results. To view our comprehensive lab test list please click below. 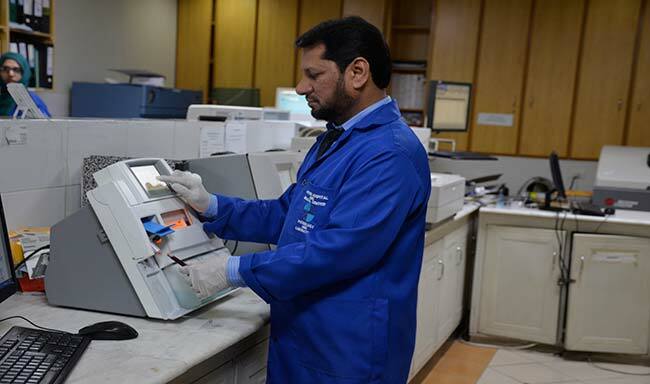 Committed to a formal yet dynamic quality assurance program, DHMC Lab regularly monitors key quality indicators. Significant variations from established performance thresholds are examined and corrective measures implemented, as needed. DHMC Lab employs a contingent of 50+ well-trained personnel working in various administrative, managerial, technical, marketing and support positions. A professional group, consisting of 5 pathologists and 1 Chief Biochemist, are contracted to provide anatomic and clinical pathology services and medical directorship in all domains currently serviced by DHMC Lab. "Our goal is to provide excellent, reliable timely quality services to our physician community and patients." We provide state of the art diagnostic testing and consultative services based on physician’s and patient’s choice and requests. The staff is experienced, board certified and commented to achieve to highest standard of patient care through providing excellent timely services and pathologic reports. Our physicians provide direct access to review and discuss all lab results. This well communication helps to provide excellent pathology services to our physicians and patients to optimize patient treatment and management plan. At Doctors hospital laboratory we strive to of a prompt, comprehensive laboratory services and accurate pathology results. In addition to our stringent quality control process we take extra step with all cancerous and unusual diagnosis. The specimens are internally reviewed by a second pathologist automatically. 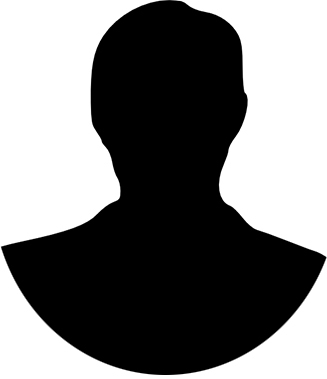 In extremely unusual cases is third opinion is obtained from the reference laboratory. In such instances, we utilize the pathology department at national and international level to confirm our interpretation. An additional opinion is requested we are happy to send the specimens for consultation to the institution of choice. We stand-by our diagnosis but appreciate the need to exhaust all possible findings to provide confidence and peace of mind in both patient and physician. We have a dedicated team of 25 Phlebotomists which are placed strategically in difference sections of Hospital for quick excess to patient and specimen procurement. The specimens are brought into the lab as quickly as possible to provide timely reports. 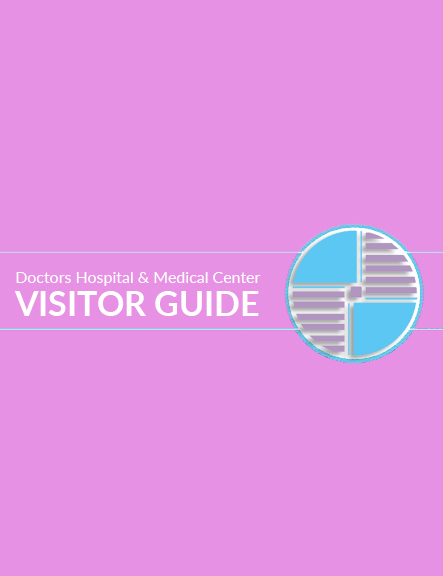 Phlebotomists are placed in emergency room department, 3rd, 4th and 5th floor of the hospital. In addition, phlebotomists are placed in both outpatient departments. A team of phlebotomists is also provide services in our specimen collection area of the laboratory. Additionally, at the physician request we provide free home sample collection service. 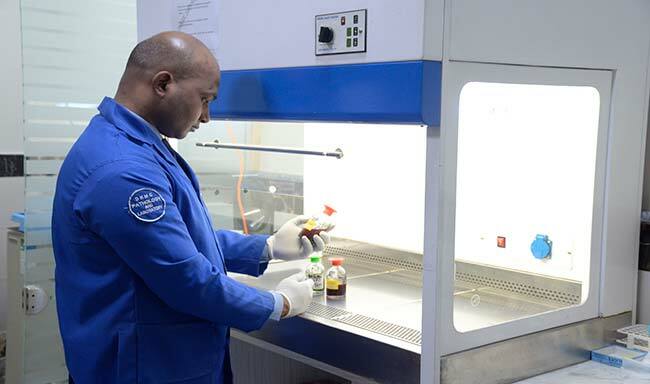 Since we are located in acute care hospital setting our clinical laboratory consists of following departments: Blood Bank, Chemistry, Special Chemistry, Hematology, Coagulation, Urine and Stool examination, Microbiology. 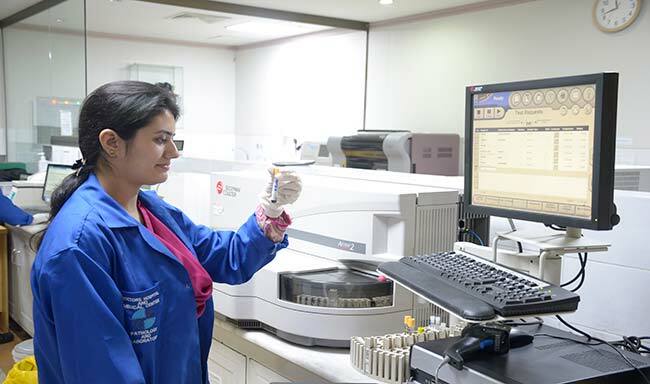 These departments provide a wide spectrum of laboratory tests in house. The list of laboratory tests is as follows. 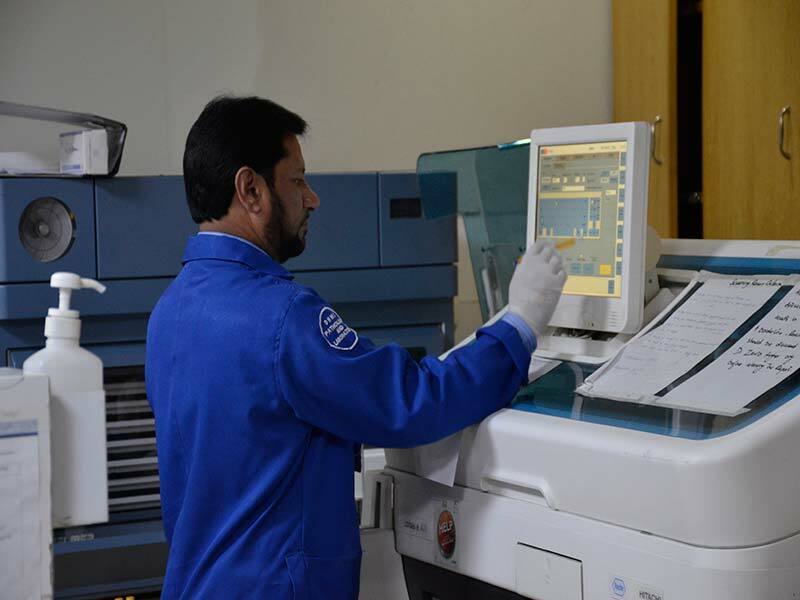 Each department is equipped with the latest state of the art equipment. 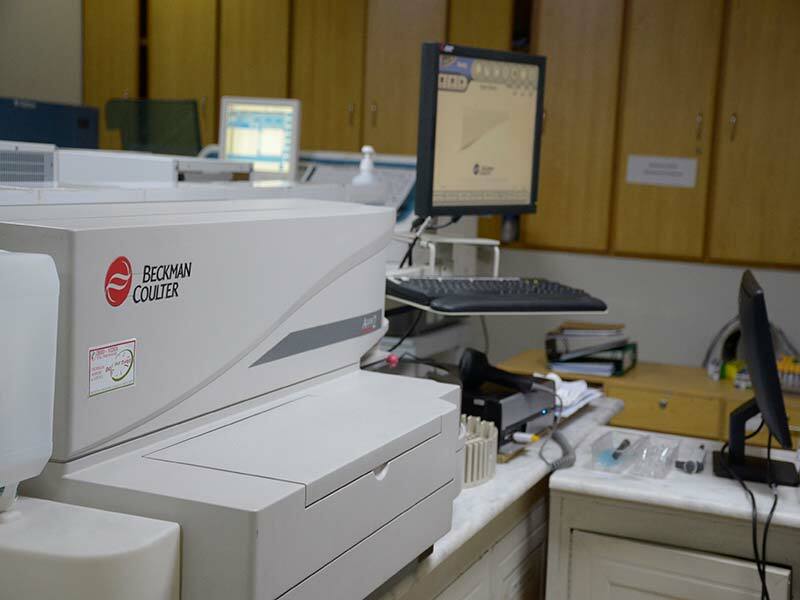 A wide range of serum chemistry tests are performed on state of the art BECKMAN Coulter Equipment AU480. This instrument has a broad list of analyzes. There is an internal quality assurance program. Duly quality control runs are tested. The equipment is calibrated as per manufactures recommendation. 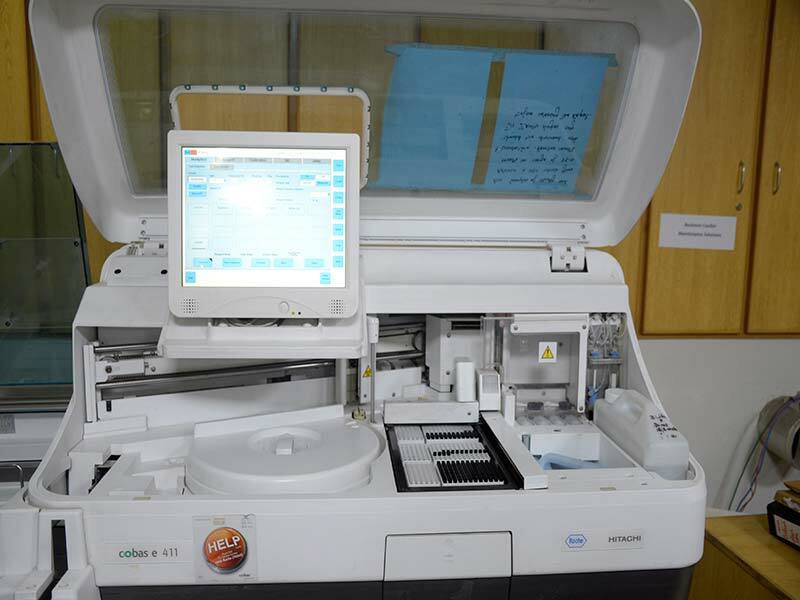 Prior to performing clinical testing every day the instrument is tested with manufactures provided quality control material to ensure proper functioning of the equipment. Daily, weekly, monthly and quarterly preventive maintenance is performed on the machine. Likewise the special chemistry equipment is excess too. 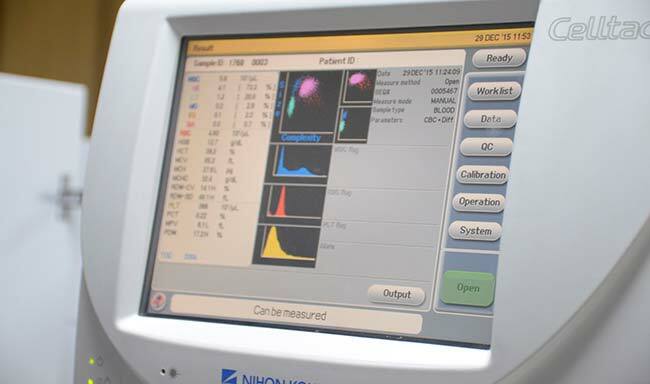 A similar spectrum of quality control is performed on this equipment prior to patient testing. Blood gasses is a specialized area which is equipped with latest equipment by SIEMENS and NOVA diagnostics. The test is performed as soon as the specimen arrives in the lab. These equipments are capable of not only providing blood gasses but also electrolytes. Provision of such test results in a quick and short time helps physicians in emergency situations in the emergency room as well as in CCU and ICU to better manage patient’s clinically. 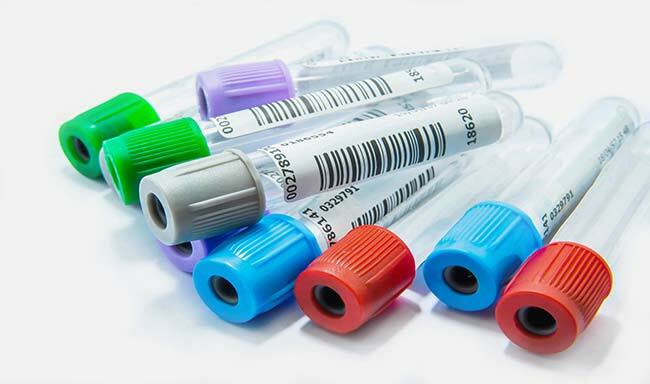 Blood bank provide ABO and Rh testing along with Coombs direct and Indirect tests. We are equipped with “TRIMA accel” equipment for plateletpheresis/cell separator. This is a most modern equipment and whenever there is a need of mega units of platelets donors are hooked on to the machine by our trained medical technology staff and a mega unit is prepared in a period of 1 to 1 and half hour and the product is available for patients in future. Since Doctors Hospital and Medical Centre is a mega heart surgery centre. We collect a large number of blood units from donors. These units are checked for infectious agents and state of the art equipment. Serological testing for hepatitis B, C, HIV and Syphilis is performed on E411.